Wow! One of the coolest concerts of Prince! The sole Italian date, and it was at Umbria Jazz 2011. At 53 years of age the singer is still very much in shape, and does not seem to be in need of the double hip replacement he is supposedly postponing. He is a Jehovah witness and his religion prohibits blood transfusions. However, it seems he is fine, as he moved on the stage with great agility and energy, playing his guitars and singing at his best. It was a great concert that took place in the square of Perugia on the main stage of Umbria Jazz. Prince did not delve too much into his early production from 1975 and the Eighties, however he did perform his 1987 Purple Rain. To think that Prince could be inserted in the Umbria Jazz 2011 program only at the last minute after Nathalie Cole (Daughter of Nat King) forfeited the date of July 15 is almost ironic. Prince has played for more than 4 hours, including encores, for the thrilled public that did not expect such a wonderful, long-lasting show. Extravagant ad-hoc costumes, impressive lighting effects, a stage backed by an eye-shaped screen projecting the concert, sound effects and scenic details projected spectators in a Tafkap dimension that was at times futuristic, at times pure concept. 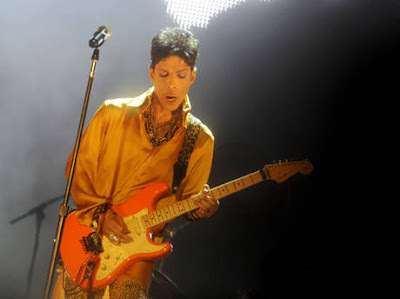 Prince cost Umbria Jazz 600 thousand Euros, and that is also why the ticket had to cost 70 euros apiece. 7 thousand people attended the concert, an event that will not return to Umbria or Italy any soon, I am sure. Till next time then, Prince, thanks for the great performance, it was worth every penny and more!